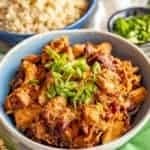 This super easy (and healthy) slow cooker teriyaki chicken has a silky smooth sauce with a deep, rich flavor. So let’s get a minor technicality out of the way right up front. Strictly speaking, teriyaki is a cooking method that involves grilling or broiling. So this is not teriyaki at all. Nor are most of the recipes you see that call for pan-frying the chicken. I made it a goal at the beginning of the year to use my slow cooker more, and not just in the winter time. Slow cooker to the rescue, no matter the season! 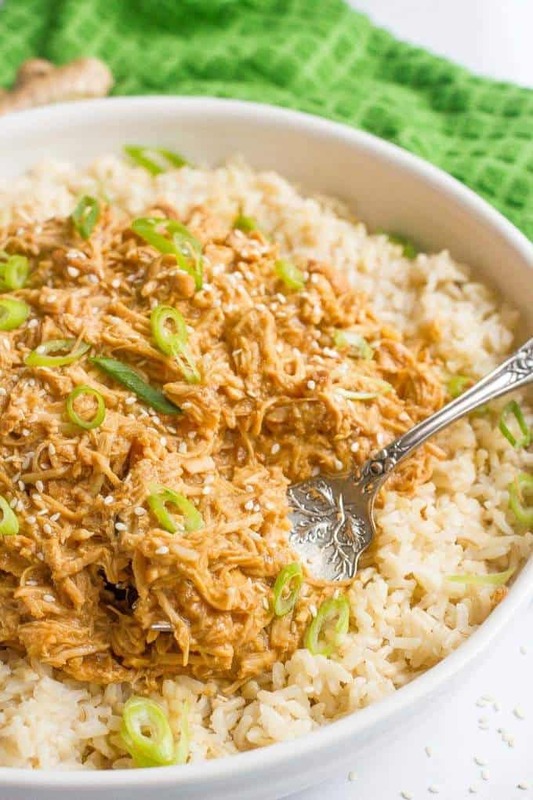 This slow cooker teriyaki chicken is one of our faves. 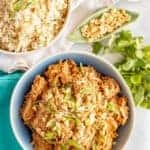 It’s super simple but has an amazingly complex flavor – the sweetness from the brown sugar, a background of mild garlic flavor, a slight spice from the ginger and the unmistakable umami flavor of the soy sauce. The sauce that it cooks in is finished quickly on the stove and becomes so silky smooth and thick. 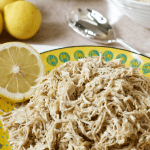 It lovingly coats every strand of the chicken and is completely addictive. You really do need to boil the liquid mixture at the end. I tried whisking the cornstarch into the slow cooker (cause I’m lazy and wanted to see if I could skip that step) and the sauce just doesn’t get as thick or achieve the same depth of flavor. It takes less than 5 minutes and one little pot. Totally worth it. This recipe makes a lot but the chicken freezes great! Just defrost and reheat in a small pan on the stove for a super quick dinner another night. I also have been known to eat the leftovers cold from the fridge. I’m not even embarrassed; it’s frickin’ delicious. Leftovers are also good in a wrap. I recommend you layer some lettuce down first so the liquid doesn’t get the wrap all soggy then add the teriyaki chicken and top it with some chopped red onion and pineapple. Oh yeah baby! 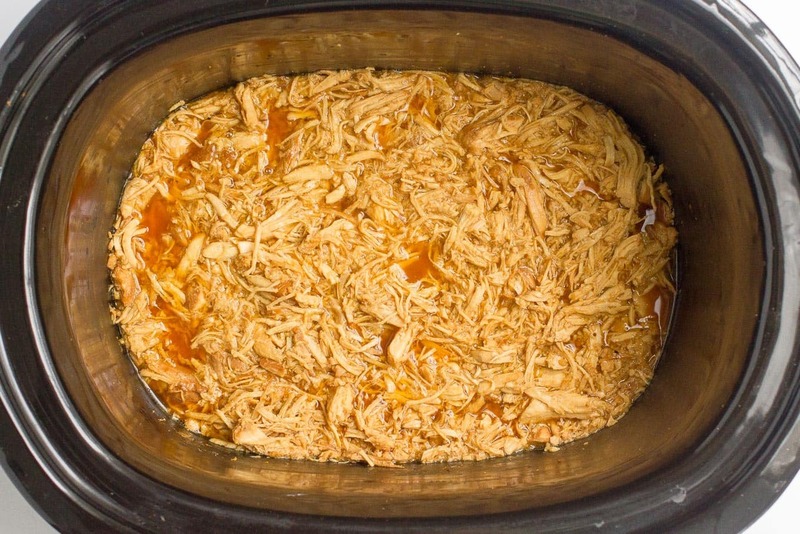 Remove the chicken breasts from the slow cooker and shred. Put the remaining liquid from the slow cooker into a pan over the stove, adding the cornstarch to thicken it up, and stir in the chicken. Let it sit over low until your rice is done and your veggies are ready. Voila, dinner is served! Enjoy! 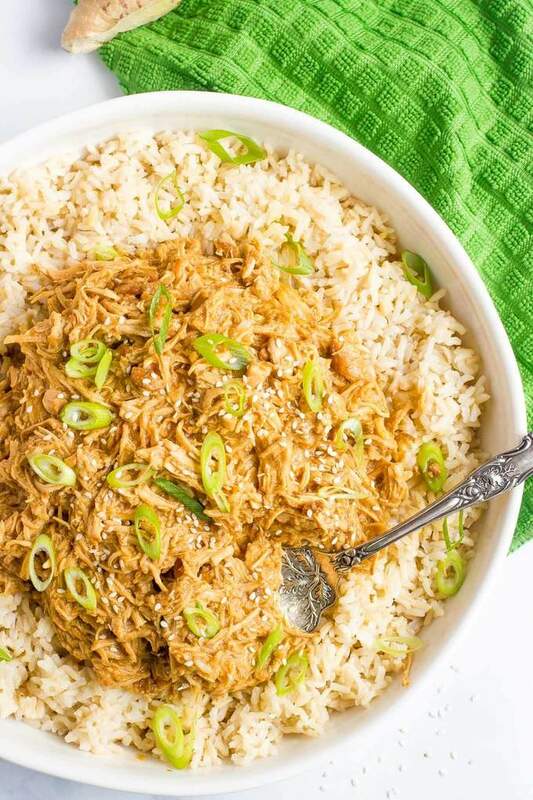 A super easy (and healthy) slow cooker teriyaki chicken with a deep, rich flavor. Whisk the soy sauce, water, rice wine vinegar, brown sugar, garlic and ginger together in a small bowl to dissolve the sugar. Pour the mixture over the chicken breasts in the slow cooker. Pour the sauce from the slow cooker into a large pot over medium heat. Whisk in the cornstarch and bring to a boil. Cook for about 30 seconds. It will thicken very quickly. Add the shredded chicken to the pot and mix to get it well coated. Reduce the heat to low and let it sit for a few minutes so the chicken can absorb the juices. 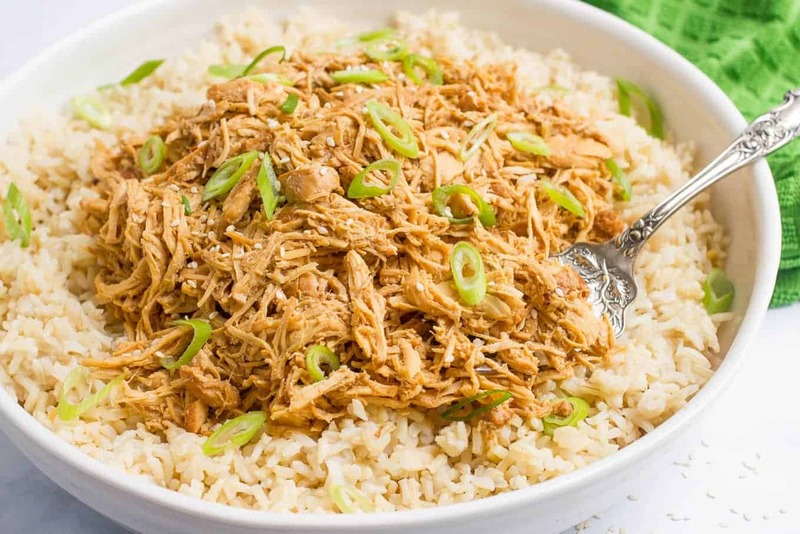 Serve teriyaki chicken over brown rice, sprinkled with sesame seeds and green onions. Tomorrow is good 😉 Thanks Rachelle! Whenever I make Asian food, I seem to end up with way more dishes and work than I originally planned. I love how easy and simple this recipe is! It looks sooo delicious! Thanks Ashlyn! It’s definitely a super simple one – but with BIG flavor! Details… they are like rules, meant to be over looked. 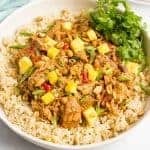 😉 I love teriyaki anything, so the fact that you made teriyaki chicken super simple and in the slow cooker has me giving you virtual high fives! 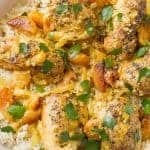 This chicken looks super flavorful and ultimately delicious! I can see why this is a family favorite!! I could certainly eat all the chicken in that slow cooker by myself. 😉 Cheers, Kathryn! Thanks Cheyanne! It is definitely addictive! It’s 10am in the morning and my mouth is watering looking at the photos and thinking I want that in a wrap for lunch. Is that bad?! I need to just go and get a slow cooker don’t I even for the summer months. Teriyaki chicken is one of our favorites! 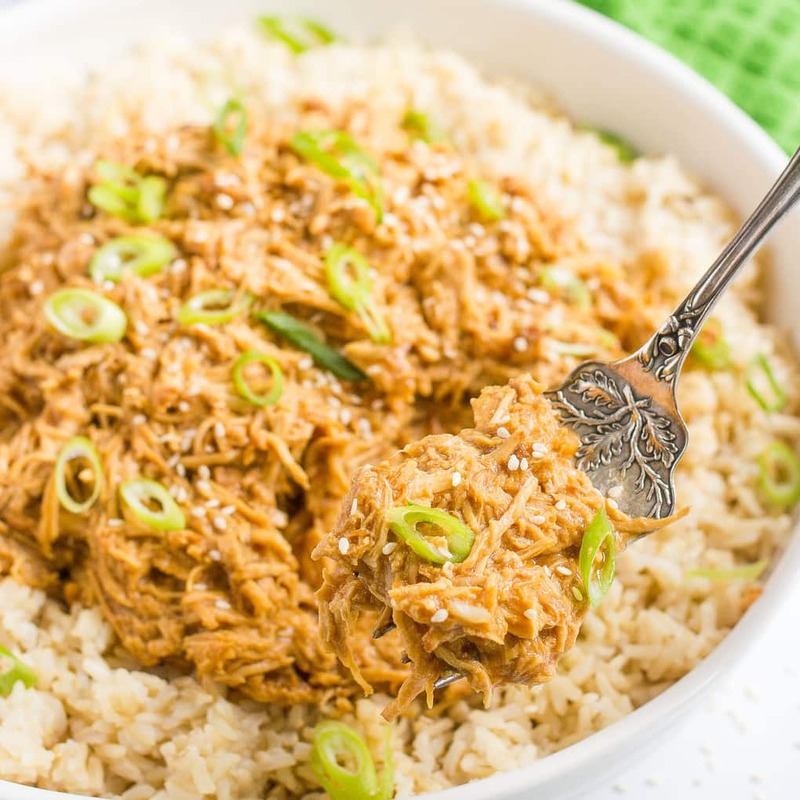 Love that you made it in the slow cooker – so perfect for busy weeknights! It really looks delicious! Great combination. 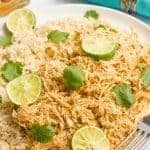 I love chicken, and this recipe enchanted me. I’m already hungry just looking at it lol, I’ll make this recipe today.Thank you!!! Thanks Maria! It’s pretty addictive 🙂 Hope you do try it and let me know what you think! Does this look like a comfort dish! Love the hint about reducing. Thanks for sharing with us at the Throwback Thursday Link party! Thanks Mollie! The reducing does make a big difference! This looks like some serious comfort food!! I can see this recipe being a hit at my house! Thanks Andrea! I hope you give it a try! Made this tonight. Came out way too salty and I could barely eat it. I used Bragg’s Liquid Aminos instead of Soy Sauce, and maybe that is why. I may have to throw out the leftovers. Curious as to what brand soy sauce you use.